artery crosses the midline over the nasal root and anastomoses with the angular artery, which originates from the external carotid artery. The facial artery branches off from the external carotid artery and courses deep to the mandible up through or behind the submandibular salivary gland. 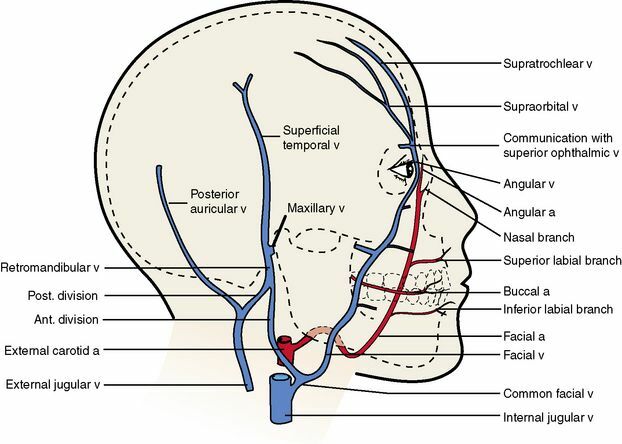 The blood supply to the lip unit includes branches of the external carotid artery: superior labial artery, inferior labial artery, and mental artery. The main goals of lip reconstruction include maintaining oral competence, adequate mouth opening, and normal anatomy for speech.